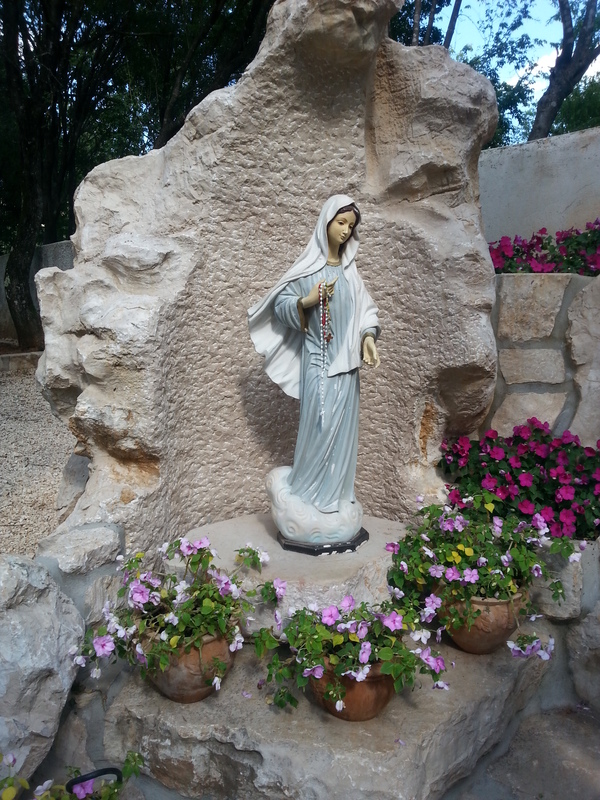 Pilgrimage Part 8: Medjugorje – the last day. 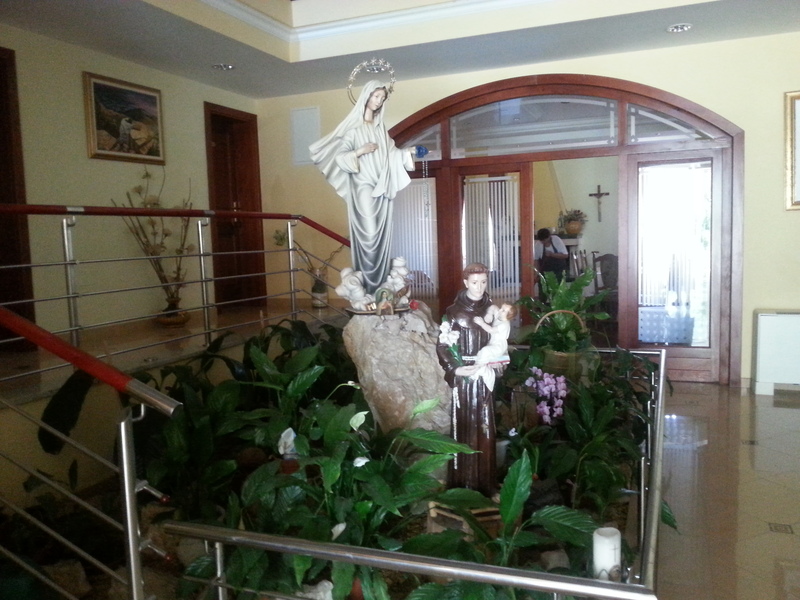 We started the day by meeting in our hotel chapel for morning prayer (as we did each day while in Medjugorje), followed by the 20 minute walk to Mass and then back for breakfast. We weren’t being picked up till after 3pm for the airport, so we made a last trip to St James church. We found the place (in the Information Centre) where we could write down our petitions. These are then placed in a basket and then offered up to Our Lady at her next apparition by the visionary involved. This was a lovely thought, so we spent a long time writing down all our petitions and those of our prayer group members back home. It was also the 17th birthday of the youngest member of our group, so we went to lunch together with “Moses”. He had bought a beautiful bunch of yellow roses for her. statue in the foyer of our hotel. At 3.30, 3 of us had to say goodbye for our long trip home. The 2 boys had left the day before to go to London to watch the cricket! (the Aussies Versus the Poms in the battle for “The Ashes”). That left 3 of our original 8. We said goodbye to “Moses” (our WYD friend), who had made a special trip to meet us at Medjugorje and stayed for the whole time to spend time with us. At dinner time, the owner of the hotel had a big layered birthday cake for our 17year old. Sadly, the rest of us missed out. But apparently, they also had cake for breakfast the next day. There was still much to see, but sadly this was the end of our pilgrimage!!! 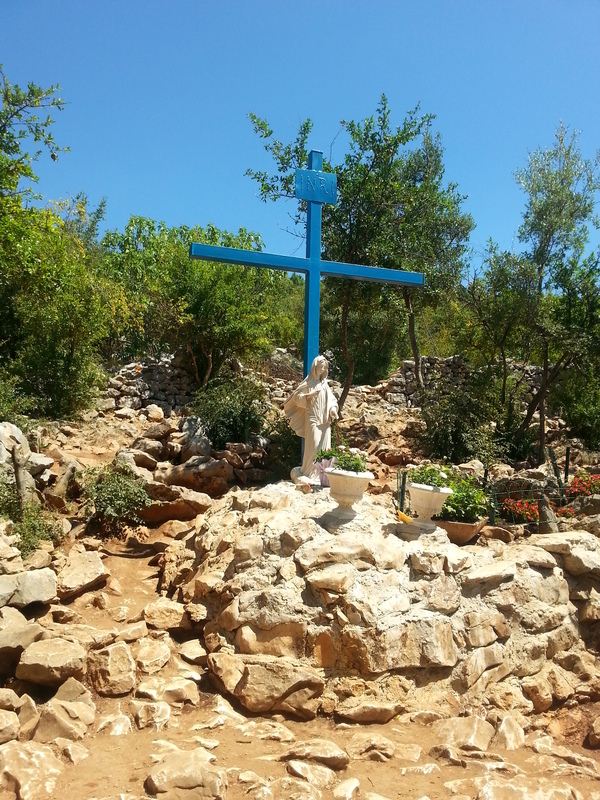 We went back to the foot of Apparition Hill today specifically to visit the Blue Cross. This is the place where Ivan once went with his prayer group. While they were here, Our Lady appeared with a Blue Cross behind her. There is a story about a woman who went there to pray for her husband. While she was praying, her husband was at home watching TV. He saw the Blue Cross on his TV Screen. We noticed that another group of pilgrims had joined us at the end of the Rosary. We began to say the Chaplet of Mercy and they joined in and at the end we sang “God of Mercy and Compassion”. (Editor’s note: I did not receive the email with the photo. Perhaps they lost the bit of paper with my email address, or they misread the address. Perhaps the image was meant for them and not for us. What we all saw on the mobile phone was an image of the blue sky, but very faintly, there was an outline of our Blessed Mother. They did not say or suggest what was on the phone, they just showed us and we all saw a faint – sort of vaporized- image. Even though we did not receive the image, I think it was providential that they arrived just as we were praying. I think they were meant to show us the picture, so that we, too, knew that our dear Mother was there with us. 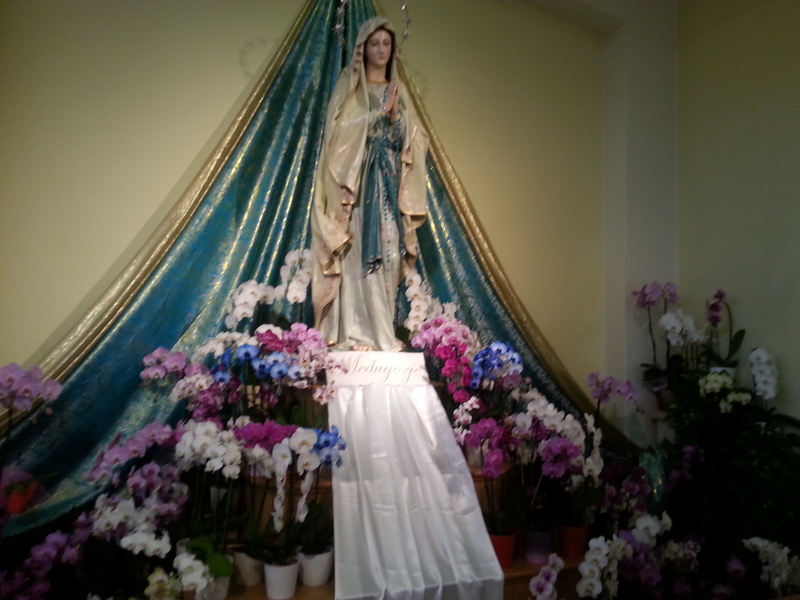 We touched our handkerchiefs to this sacred spot because Our Blessed Mother had stood there. Interestingly, they had been doing the same thing with their hankies. Just 5 minutes down the road was this wonderful place founded by this nun who had a vocation to helping troubled youth and getting them off their addictions by hard work, prayer and adoration. We listened to their testimonies. They have houses all over the world. 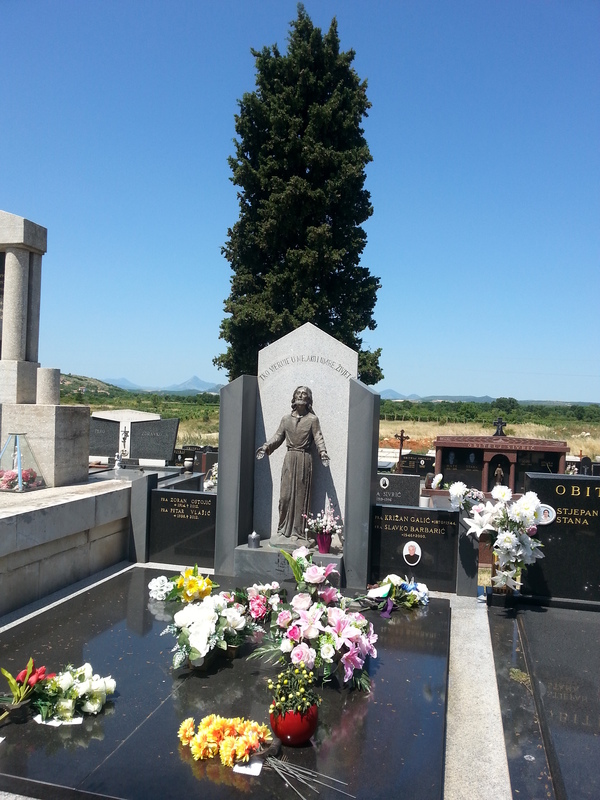 When they came to Medjugorje, Fr Slavko supported them in whatever way he could. They rely completely on Providence. They can stay for 3 to 5 years until they are secure. They have an amazing success rate. We were able here to write all our intentions down on a piece of paper and put it into a special sealed container made from one of the large rocks on Apparition Hill. Two Masses will be said for our intentions, after which they are burnt with the smoke going up (as incense) to God. This thought pleased us. Yesterday, 12th July, we set off for Cross Mountain. This hill is in the opposite direction to Apparition Hill but is much higher. The path up the hill is covered with the same rocky terrain as Apparition Hill. We caught a taxi there because we didn’t want to tire ourselves out before we even started. Five of us are between the ages of 65 and 75. 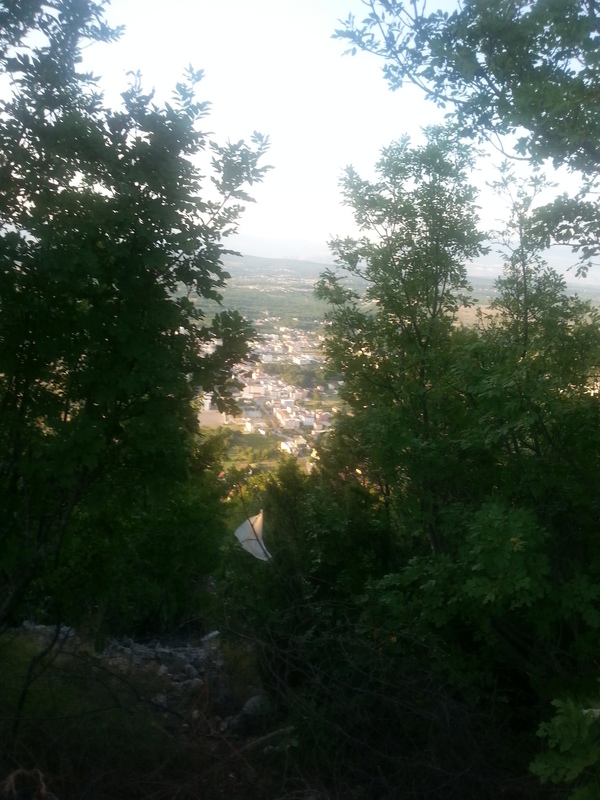 Apparition Hill was difficult, but Cross Mountain was to prove much more difficult. Instead of 5 decades of the Rosary, there were 15 Stations of the Cross,but we made it. This was a different story and a much bigger challenge. Other people joined our little group (including “Moses” ) and we ended up with 12!! To make it worse, 2 of us had badly swollen legs (probably a result of our hectic schedule over past few weeks) but they desperately wanted to try to do it for our dear Lord – to offer it all up Him and to pray for our Prayer Group intentions. So off we went in fear and trepidation. We used the prayers and the readings from the little booklet written by Fr Slavko for the Stations of the Cross. The stations were distanced further apart than the Rosary Mysteries on Apparition Hill. I thought we would never get there. The young just leaped over the rocks and stones while we hobbled and tried to keep our balance. 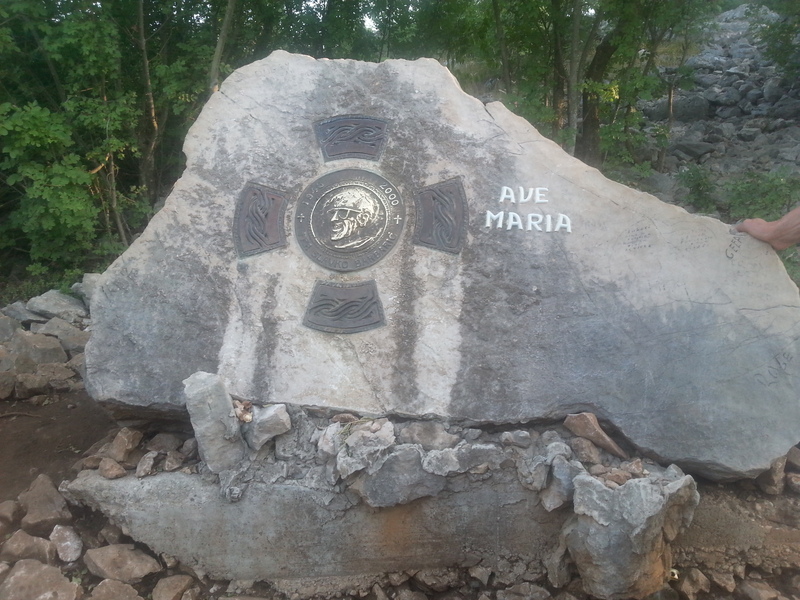 Between the 13th and 14th Stations, there was a rock memorial for Fr Slavko, marking the spot where he died. (See post on. 12 July). 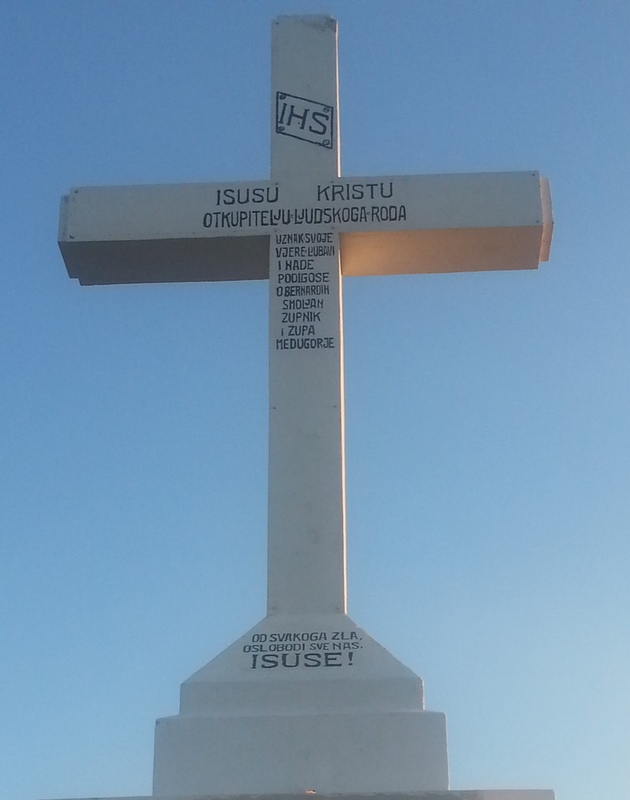 At the top was a huge, white Cross erected in 1933. The inscription on it was: 33-1933. Apparently it was a Jubilee year and it was erected to celebrate 1900 years since Jesus’ death on the Cross. It is interesting that it is so big. Also the old church was rebuilt in the 1930’s – the present St James Church. 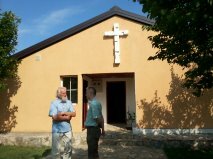 It was a tiny village and the church seemed way too big for what was needed. Was it Providence that was preparing for the time when it would be needed? While we were up there the bells of the church down below chimed for the evening Mass. It was so loud and clear and seemed to be magnified by the hills. 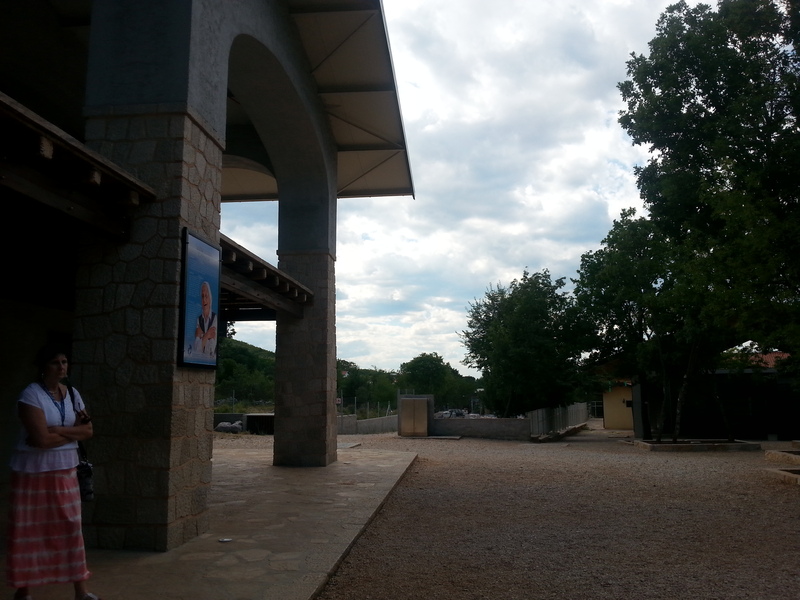 Medjugorje seemed to be nestled in the hills, as at Garabandal; even the amphitheatre effect was there. We stayed a while for photos, a rest and to pray for all our intentions. We headed back. Some found going down more difficult than going up – especially on the knees. We finally made it down. It took much longer than we expected – nearly 4 hours. We were told 2.5 hours. Needless to say our youngsters were down a good half hour before us. We thanked God for getting us down safe. We thought that it was quite miraculous that the person in our group with the swollen feet had made it! She could not walk the day before and was in a bad way, but she so wanted to try… She thought that if she got stuck she would just sit down and wait for us to come back. 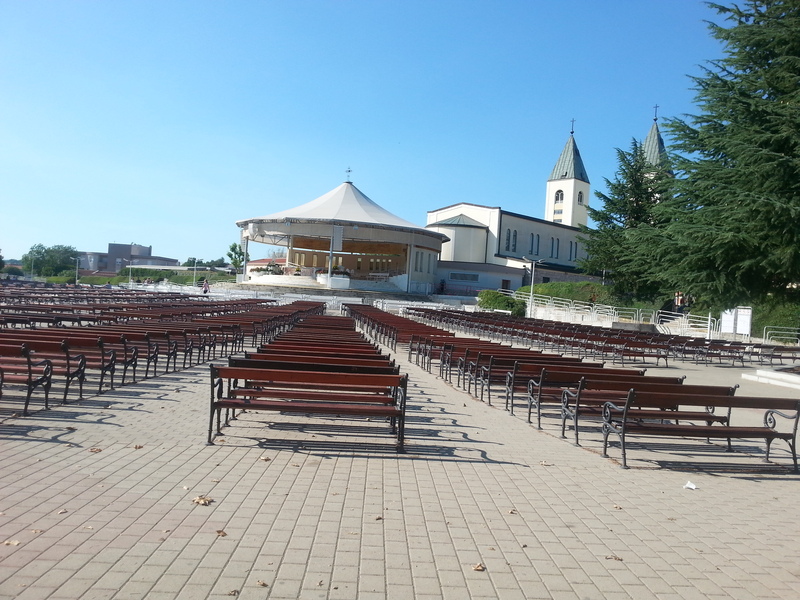 On 10th July, our first day in Medjugorje, we met up with our WYD friend (Moses) and we went for a walk to see the layout of the Church, the Franciscan Piety Stall, the outdoor altar and the huge area of seating that is capable of holding thousands of people, ( see post on Adoration), Fr Slavko’s grave, the outdoor statue of Our Lady at the front of the Church, the shrines made with a tile mosaic of the Joyful Mysteries of the Rosary and more. 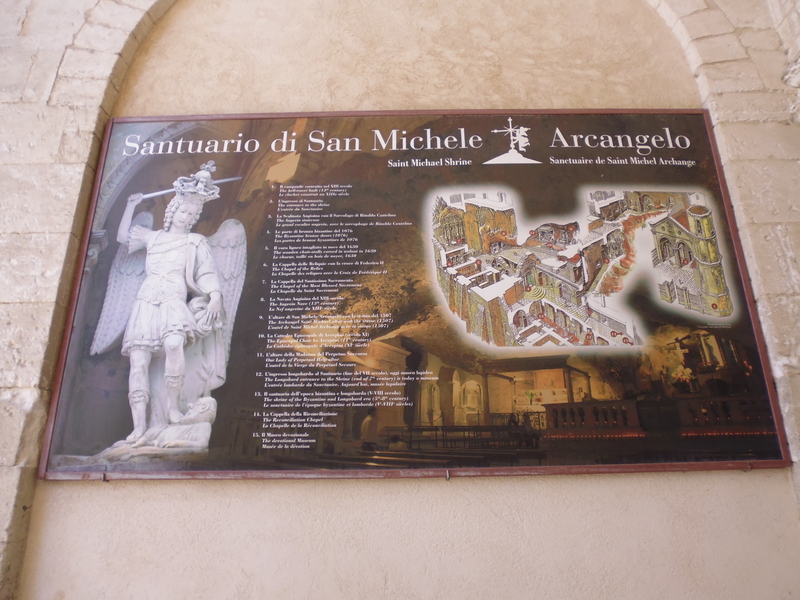 This priest is famous for his work here. 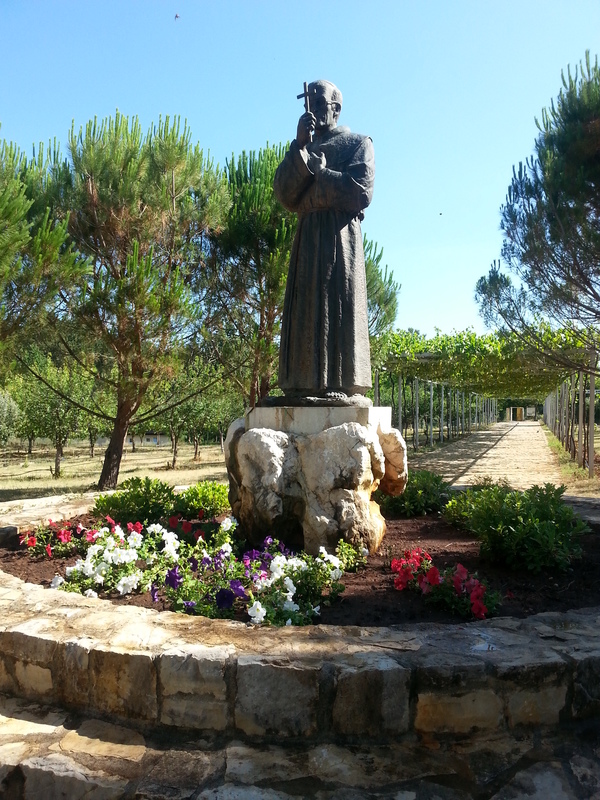 Fr Slavko would get only 3 hours sleep per night. He died after he climbed the hill with the Cross. 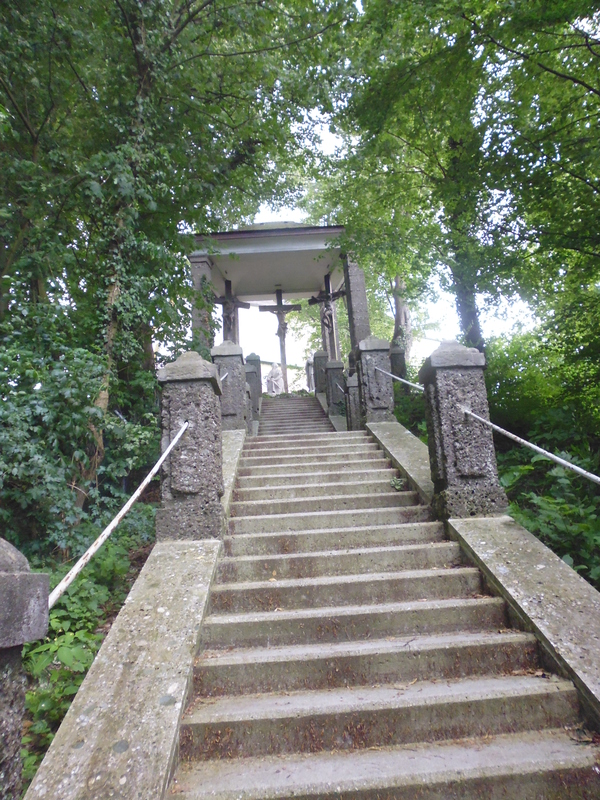 The climb has the Stations of the Cross. It is stony and rocky just like the Apparition Hill, only longer. When he got to the top he sat down and said he didn’t feel well. This was between the 13th and 14th Station. Then he died. 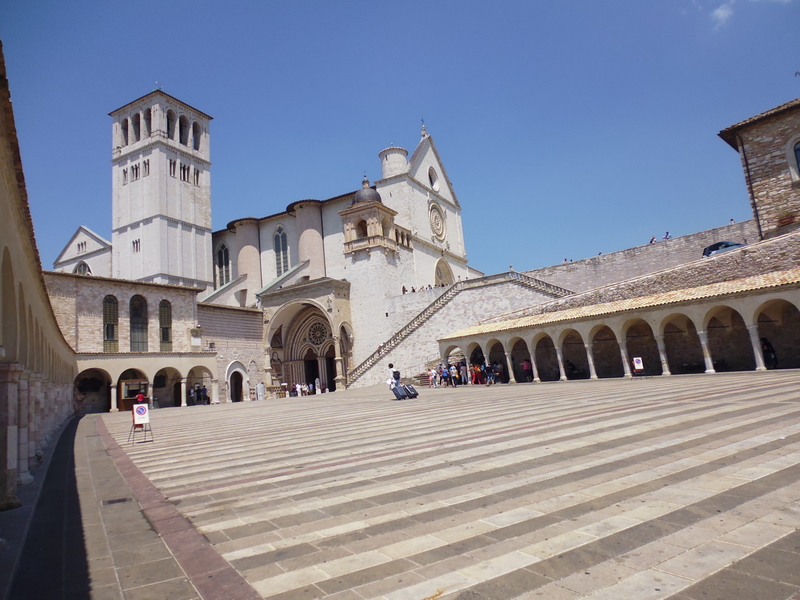 There is a case where an American pilgrim had climbed this hill who had been away from the church for a long, long time. She met a priest on the way and he explained to her about Confession and the commandments. She was so enthused she went straight to the church for Confession. Later, she noticed a picture of this priest hanging on the wall of the piety shop and pointed him out and said that she had just been speaking to this priest out on the hill. The only thing was that he had already been dead and buried. This crucifix is rather modern in its form and not to everyone’s liking. It is made of bronze (or brass). It shows the cloth wrapped around Jesus’ hips and which has one corner hanging down at the back and which is tied in a “b ow” at the side. It all looks rather odd. This sculpture has some cracks and seems to weep water, even if it is dry and hasn’t rained. People are seen mopping up the moisture with cloths. It is asserted that a person who was blind received one of these cloths and put it on his eyes and was cured. This information has been contributed by a fellow JTM Crusader. 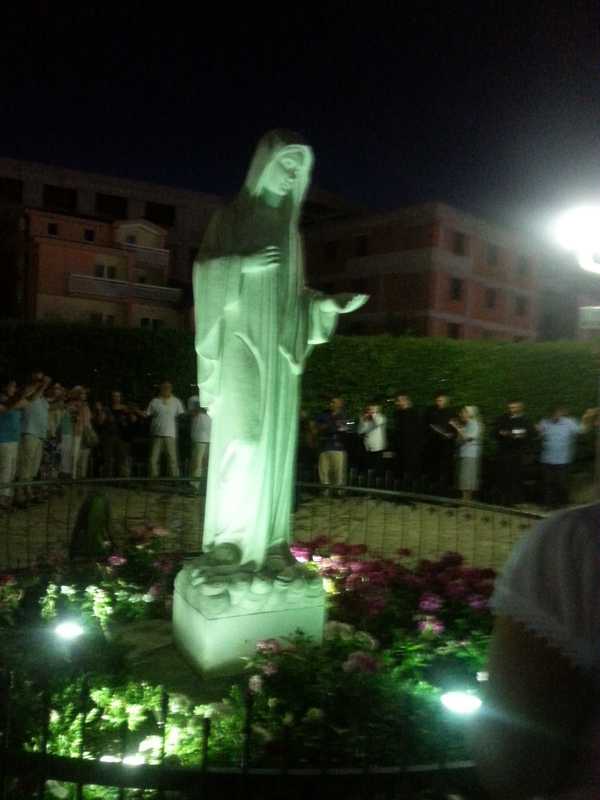 *About every 200 ft (65 m) there was a brass depiction of each of the Joyful mysteries of the Rosary. 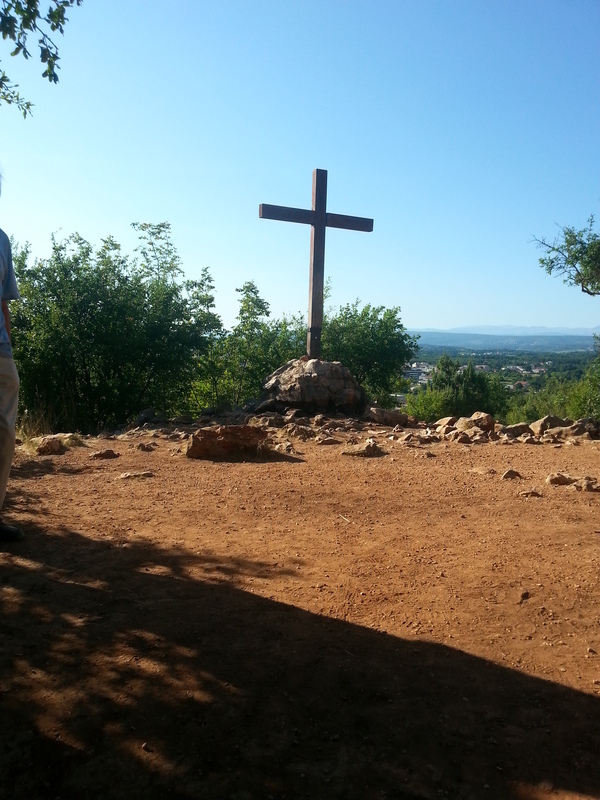 *The whole walkable path on Apparition Hill is in the shape of a giant Rosary when viewed from above. Behind her, Maria could see a cross. *The Permanent Sign on Apparition Hill: (same as Garabandal). Vicka: “Why to show the people that She is here among us…I’ll just say this: whoever does not believe without a sign will not believe with a sign. Ivan: “For those people, it will be too late. The Blessed Mother says that is why God is giving so much time for these apparitions, so that all may come to conversion. She wants to make certain that all people have this opportunity. She can’t help anybody who doesn’t want to change, who doesn’t come back to God, who doesn’t put God first. PADRE LIVIO – So, in essence, the discourse is this: the Madonna urges us to convert, she tells us not to wait for the sign on the mountain in order to convert, and in any event, «…all the secrets that I have confided will be realized and also the visible sign will be made manifest. When the visible sign comes, for many it will already be too late», (December 23, 1982). What does that mean? VICKA – The Madonna did not explain why it will be too late and I did not ask, she only said that we are now living in a time of grace.